Vested Marketing is pleased to announce their recognition from HubSpot as a Certified Agency Platinum Partner. 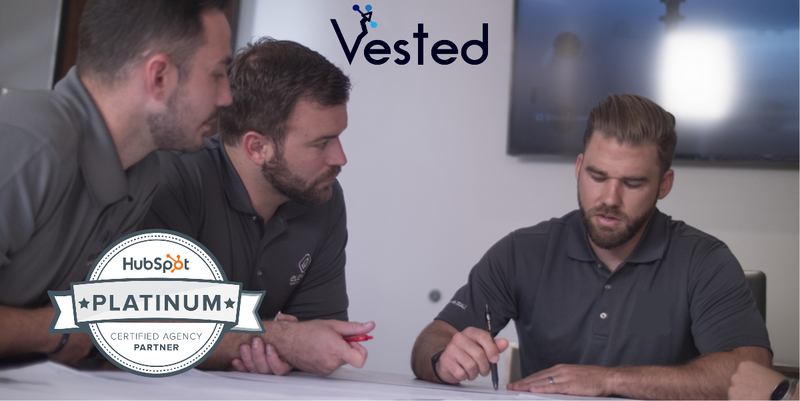 Vested is one of the fastest growing HubSpot agencies winning the Rookie of the Quarter and achieving platinum partner status by solving for the customer and exceeding expectations in record-breaking time. "This agency practices what they preach with a hands-on approach to strategy and execution." Inbound marketing is about creating valuable experiences that have a positive impact on people and your business. We do that by attracting prospects and customers to your website and blog through relevant and helpful content. Once they arrive, you engage with them using conversational tools like email and chat and by promising continued value. And finally, you delight them by continuing to act as an empathetic adviser and expert. As a HubSpot Platinum Partner, we help companies like yours build a solid foundation to raise brand awareness, generate new leads and grow revenue. It’s a combination of methods used across platforms that delivers the greatest results. Contact Us for your free consult!